MAKE ART 2009 – What The Fork?! distributed and open practices in FLOSS art :: December 7-13, 2009 :: Poitiers, France :: Call for Projects — Deadline: July 15, 2009. 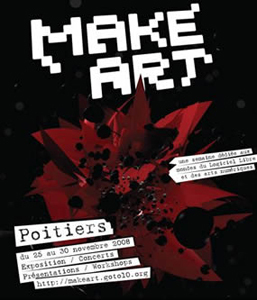 Make Art is an international festival dedicated to the integration of Free/ Libre/ Open Source Software (FLOSS) in digital art. Make Art offers performances, presentations, workshops and an exhibition, focused on the encounter between digital art and free software. Make Art is currently seeking new, innovative FLOSS works and projects: music and audiovisual performances, presentations, software demos, and installations. This year Make Art focuses on distributed and open practices in FLOSS art. by decentralised software development tools, such as Darcs, Mercurial and Git. It’s not about quick hacks, but about creating room to experiment, letting go of the one working copy and creating a multiplicity of ideas. Read the submission guidelines, download the form, fill it in and return it to: makeart2009 =at= goto10 =dot= org before the 15th of July 2009.